­Journalist and autism campaigner Owen Spencer-Thomas was awarded an honorary doctorate for his services to the voluntary sector and journalis­m by the University of Westminster. This is the full text of his acceptance speech after receiving his Honorary Doctorate of Letters, conferred by the University and presented by the University’s Vice-Chancellor, Professor Geoff Petts, in a ceremony at the Queen Elizabeth Hall, London, on 18 January 2010. I am most privileged to receive this Honorary Doctorate from a University that plays such a big part in developing the potential and talent of tens of thousands of students who come from so many different parts of the world. Forty years ago when I received my first degree, I never dreamt I would be standing here today robed in scarlet. 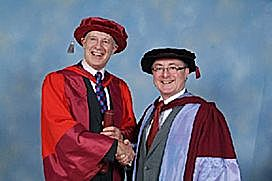 Soon after they offer you an Honorary Degree, one of the first questions the University of Westminster asks you is the size of your hat. Now was it to make sure this splendid scarlet academic cap fits or did they want to know by how much my head had grown? Well, I share this day with 200 other graduands, men and women, from all walks of life, who have spent several hard years carrying out advanced research and adding to our knowledge. This is your day too and I congratulate you on your splendid achievements. I was a student at The Polytechnic, Regent Street. Many will know, The Poly, as it was affectionately called, was the forerunner of the University of Westminster, gaining its new status in 1992. My days in higher education during the Sixties, were among my most memorable. It was a time of massive change and social revolution, rapid expansion in Higher Education, and the era of student unrest. I was privileged to become the first sabbatical President of the newly formed Student’s Union in 1966. It was then that I first understood how many of one’s achievements come from the inspiration, collaboration and support of many other people, colleagues and friends. I would like to take this opportunity to thank them all and share this honour with them. Whatever the title, an award not only honours the recipient, but it also honours and raises the profile of the profession, charity or sport in which a person has excelled. I hope I can continue to be a worthy standard bearer both for journalism and for autism charities, as well as the Church in which I am an ordained priest. For it is in these areas that my heart also lies. I have been fortunate to work as a journalist both in television and radio during times of innovation and growth when we had abundant opportunity to take risks and develop new programme forms. The emergence of interactive broadcasting offers new opportunities to today’s journalists. But as the media compete in an increasingly tough market, journalists come under greater pressure to compromise their commitment to truth and accuracy. And I think it is the duty of elder statesmen in the profession to support and encourage those who follow us and want to maintain high standards in journalism. Television has its own way of humbling people. Despite the hard graft that goes on behind the scenes, I think I shall be better remembered for my brief appearance on ITV’s It’ll Be Alright on the Night. I was reporting on the flood stricken village of Alconbury Weston in Cambridgeshire. We had borrowed a canoe, which I promptly capsized. I was drenched to the skin for all to see. Now the great irony for me is that although communication has been central to almost all my work, our elder son has severe autism. Huw can neither speak, nor read, nor write. His understanding of the world around him is cruelly constrained and very different from yours or mine. But despite his lack of language, he is among those who taught me and in his own way encouraged me and my family to campaign for people with autism. His needs and the needs of many like him stimulated a small group of us to start from scratch and to campaign for specialised accommodation for adults like him. Huw propelled me into the challenging world of fundraising. In our spare time we raised over £1,000,000 to provide Cambridgeshire’s first unit. And on that journey we had many other successes. With these thoughts in mind, I proudly but humbly stand before you to accept this Honorary Doctorate which you have so kindly bestowed upon me.